The Sacrament of Reconciliation is a domestic performance experiment in contagious healing through forgiveness. It starts as a tactile, ritual experience for four to eight people in a domestic setting. 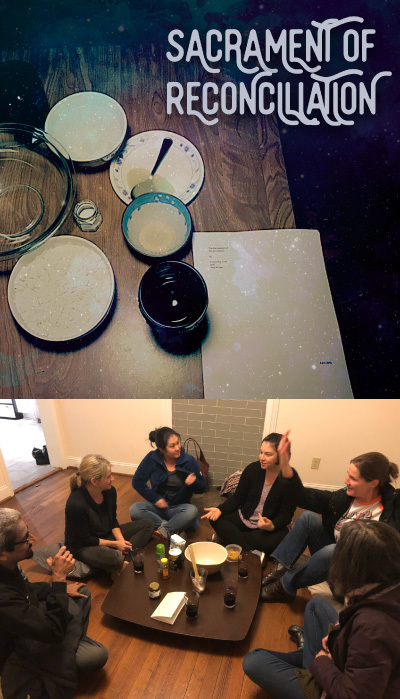 A sacramental text guides each group through a 2-3 hour evening of increasing vulnerability, where time passes in glasses of wine and communal bread-making. SoR uses game mechanics, Catholic tradition, and the magical properties of intimacy and vulnerability to invite witnesses into a transformative moment of healing and joy. The Sacrament of Reconciliation is a ritual in four parts. Each section moves through the stages of making a loaf of bread while participants answer questions, meditate on their own lives and share their intentions for forward movement. Each witness is offered an opportunity to be present with other people in a shared space. This piece encourages decentralization of power around performance and asks that each witness be active and present with everyone involved. The Sacrament of Reconciliation draws from theories of emergent strategy, communitas and the belief that small moments weave the fabric of new cultures; That many people, engaged meaningfully in small actions, can change the world. 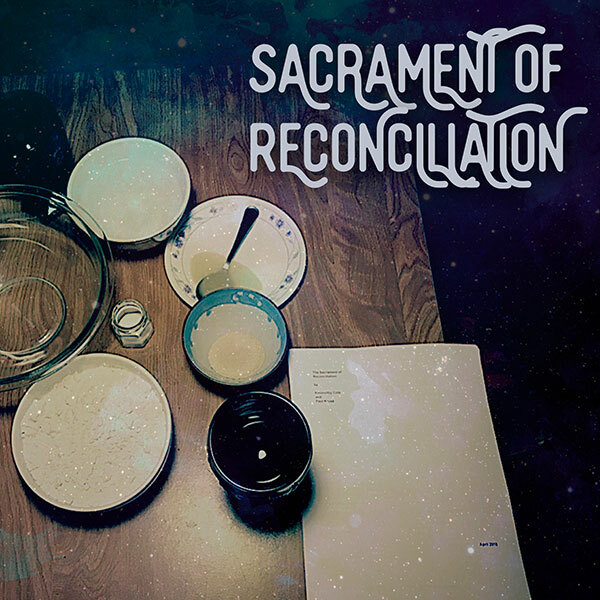 The Sacrament of Reconciliation is part of a seven-volume series that serves to reinvent the seven Catholic Sacraments as secular rituals for intentional communities. Sacrament of Matrimony is a featured work at the 2019 Cohen New Works Festival. Kimmothy Cole is a ritual, visual and performance artist creating new work under the influence of ancient aesthetics and cultural concerns. Their work favors smallness over notoriety and the decentralization of power over fame. Each piece is an experiment in the development of community through intimacy and immediacy. Cole’s work as a collaborator and performer has been featured in projects, festivals and events across the United States. Paul William Kruse is a playwright, film/video maker, and teaching artist from western Wisconsin, living in Austin, Texas. He is a founding member and resident playwright of Hatch Arts Collective in Pittsburgh, Pennsylvania. Paul’s work flows from his queer identity, Catholic roots, and ever-evolving experience of family. He creates stories in the context of community. Paul’s play Chickens in the Yard was recently included on The Mix from Steppenwolf Theater Company. Paul is currently a fellow at the Michener Center for Writers at the University of Texas at Austin where he is pursuing his MFA. The Sacrament of Reconciliation can only seat 6-8 people so purchase tickets in advance. NOTE: Tickets for Sacrament must be purchased in advance. Tickets will be available online until 12 hours before the event. Tickets will be available at the INTERSECTION BOX OFFICE (1920 Commonwealth Ave.) until 6 pm on Saturday.